This CD is loaded with beautiful sketches of flowers that I did while visiting Sugar Hill Farms in Northern CA. Included on this CD is the outline sketches for Roses, Rhododendron, Sunflowers, Clematis, Fall Leaves and Fox Glove. I have designed the the large clusters to fit in a large hoop, 9.5x14", 8"x14", and a 8"x12". You will also get individual flowers from most of the groups and in some case multiple images in 6"x6", 5'x7" and 4"x4", that you can add to increase the original design or you can put on coasters, blocks etc. You can not only color these but you can paint them, use inks, crayons etc and use them for quilting etc. I use a black thread to stitch out each design and then I use colored pencils to color them. I also offer an online class on this technique and others for your convenience, check out my classes. I know you will love these beautiful images created for you by me. I am calling this CD Color Me Quilts- Sugar Hill Farms. 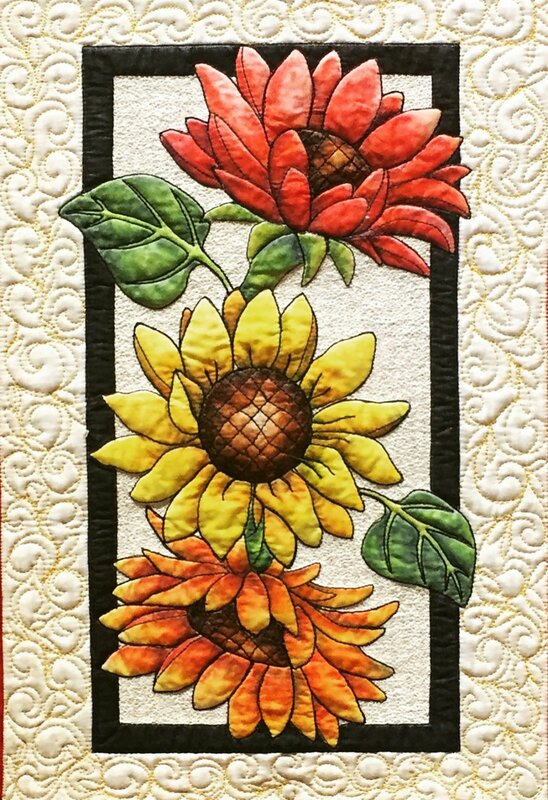 I am also including the PDF pattern of my table runner for you to create you own beautiful table runners or wall hangings. This can be upsized or downsized as needed. Please note that there are no coloring instructions on the CD, only instructions on how to make the table runner. You can color these with many different techniques and I am only offering these as a fabric coloring surface. If you would like to learn my techniques I teach onsite and also offer online classes.